ID Festival Berlin has 3 locations this year: the music program and the performance, “Cinderella. The Nutcracker”, will take place in Radialsystem, the Kurt Weil Program “Speak Low when You Speak Love” will be performed in WABE, and the theater piece the “The Land of Milk(y) and Honey? ” will happen over the total of 6 days in English Theatre Berlin | International Performing Arts Center. In September 2006, RADIALSYSTEM was opened as a new creative space for the arts in Berlin. Formerly a turn of the century pumping station for the Berlin Wasserwerke (Berlin Water Services), RADIALSYSTEM – situated in the urban centre of Berlin between Friedrichshain, Mitte and Kreuzberg – currently functions as a cultural centre where new ideas ‘radiate’ out in all directions, attracting artists and the public from within as well as beyond the city limits of Berlin. The WABE is a multifunctional cultural event venue. 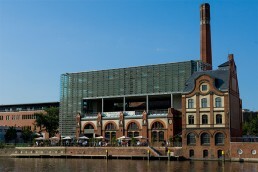 It is the largest municipal cultural institution in Berlin’s Prenzlauer Berg district. The WABE sees itself as a concert hall, trendy club, cinema, space for innovative cultural projects, rehearsal room, meeting and consultation room, multicultural venue and last but not least as a meeting place. From rock music to jazz to classical music, from children’s events to senior dance, from readings to theater productions, from folk dance to dance performance, the program range is versatile. English Theatre Berlin | International Performing Arts Center (ETB | IPAC) is the German capital’s only producing and presenting organization in the Hauptstadt expressly dedicated to English, the 21st century lingua franca, as the working language, as a bridge between cultures, countries and traditions.